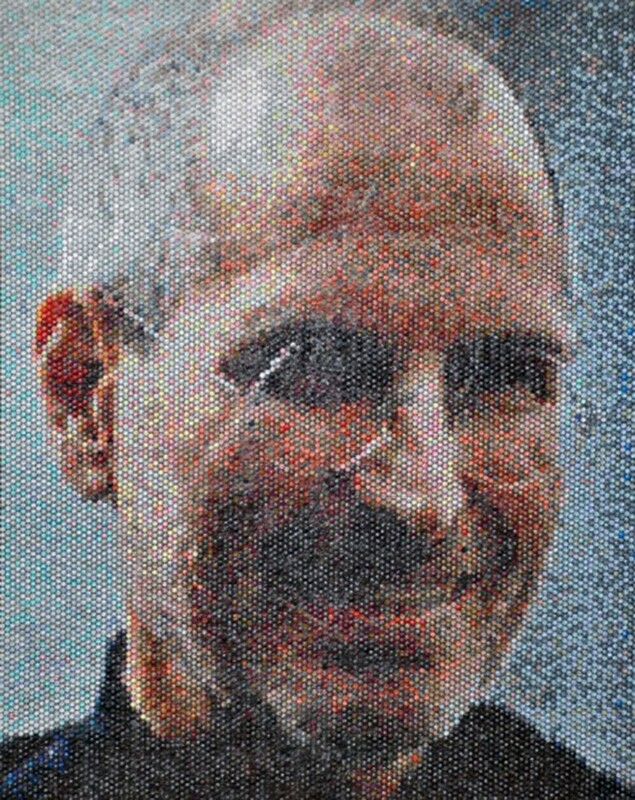 Bradley Hart injects paint into bubble wrap for photo-realistic portraits, like this one of Steve Jobs. Apple fans felt a deep sense of mourning in 2011 when Apple founder Steve Jobs succumbed to cancer. With the fifth anniversary of his passing approaching, Cult of Mac looks at the artistic tributes that followed. From afar, the colorful portrait of a smiling Steve Jobs looks like a pixilated portrait made with an early digital camera. Get closer and those pixels take on a shape familiar to your thumb and forefinger — bubble wrap. Jobs would appreciate Bradley Hart’s “Think Different” approach to bubble wrap as well as the hyper-focus attention Hart pays to inject each bubble with a different color of acrylic paint to form a famous face. In the weeks following the floral and candle tributes to Jobs at Apple Stores, artists around the world used their talents to memorialize Jobs and the imprint he left on creativity and innovation. Some used their Apple devices to draw, paint and collage while others turned to long-standing mediums like paint and bronze to immortalize him. 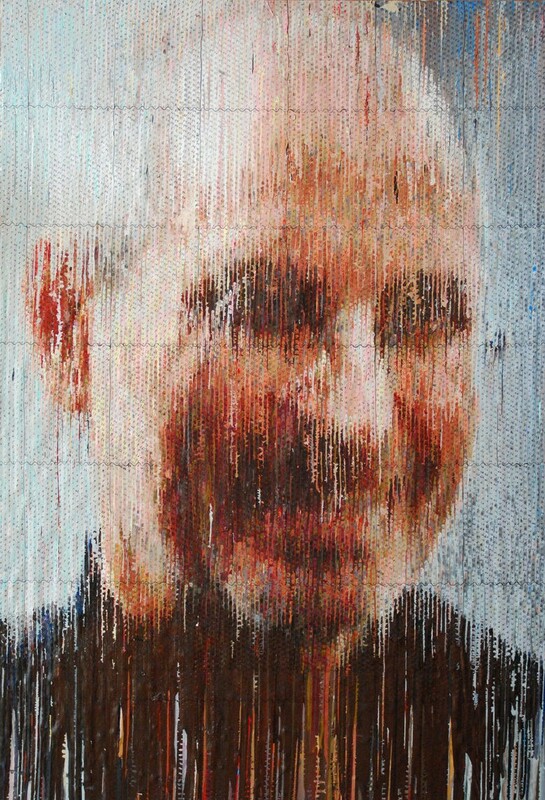 Steve Jobs would probably smile back at this bubble-wrap portrait by Bradley Hart. Hart is likely the only one to use bubble wrap as a blank canvas. Each piece creates two, one-of-a-kind pieces — the photo-realism portrait in bubble wrap and smeary, dreamy acrylic print on wood created from the paint dripping out of the back of the bubbles. 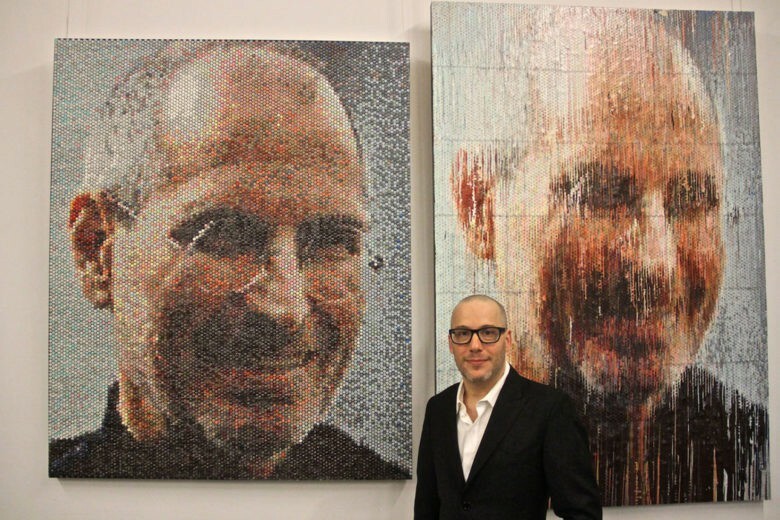 The Jobs piece, one of his first five bubble-wrap creations, was made in 2012 and quickly sold at a show for an undisclosed amount. The impression print is still for sale and inquiries can be made through his representative, Anna Zorina Gallery in New York City. Paint dripping from the back of the bubble wrap is captured for a second portrait on wood. Hart knew he was making mischief when he decided to work in bubble wrap. It’s a material we feel compelled to begin popping and yet we are never allowed to touch art. The average bubble-wrap portrait can take more than 300 hours, and he has created more than 40 with an equal number of companion prints made from the dripping paint. The paint inside each bubble eventually dries, taking the pop out of bubble wrap, but also ensuring the piece will have longevity. Hart does not divulge many specifics about his technique, but to get the photo-realism effect, he selects a sheet of bubble wrap (he buys it roll by gigantic roll) that is roughly 6-feet high and 5-feet wide that go on a canvas stretcher. Some pieces are larger. The Jobs piece was among his first five and was only 4-feet by 5-feet. On his iMac, he uses a photo, usually of a public figure or famous image but sometimes a scene, and begins to map out colors. Then comes the most time-consuming part of the process — filling up as many as 2,500 syringes with paint. In his studio, there is a wall of more than 100 colors of paint and racks of syringes. Hart calls the process of injecting paint into bubble wrap meditative. “If people didn’t know I was an artist, they would think I was running a major heroin outfit here,” Hart said. As many as 1,500 syringes are used on a single bubble-wrap portrait. Each bubble is hyperinflated with the paint so that it drips to create the second piece. There is no waste in his studio. Old syringes get reused and globs of paint get scraped up and eventually used to create sculpture. Hart saves everything and declares himself his own ecosystem. He says the creators of bubble wrap might be pleased to see it hanging on a wall. It was invented in 1957 as a modern wall covering. It was a flop as decoration, but eventually caught on as a way to pad fragile items for shipping, he says. Hart’s energy contradicts his process. Words sprint from his mouth as he springs from thought to thought. There are detours and he sometimes asks for help in circling back to the original question. He is excited about what he does and he quickly gets you excited about the work. But when it’s time to face blank bubbles, he downshifts and locks in to fill the tiny air pockets that otherwise give the rest of us the satisfaction of pop.